What did homeschooling look like when your oldest was 5? How much time? What subjects? When my oldest was 5, I had a 4yo, a 2yo and a baby. I may also have been pregnant and suffering with severe morning sickness, depending on exactly when in the course of that year we are looking. It was not an easy season in life, but I was a control-freak very disciplined and organized person. I was feeling seriously challenged, but I had not yet given up on the idea that I could do it all. I placed a lot of emphasis on having a firm and predictable daily schedule, and this actually worked reasonably well for us in that season. I had to build in plenty of time for diaper changes and other interruptions, but the toddler learned that school time was high-chair time, I could nurse the baby with one arm, and that just left 2 “older” children to teach, so we were able to do most of what we planned to do each day. Part of the reason were able to do this is that we were organized and I was disciplined, but another reason is that I kept my expectations reasonable. I didn’t try to do a full 6 course curriculum with the 5yo and a separate Preschool curriculum with the 4yo while wrangling a baby and a toddler. Instead, we used Five in a Row, and even then we didn’t follow the instructions exactly or use every single idea in the book. We made it fit us, rather than making our day fit the book. 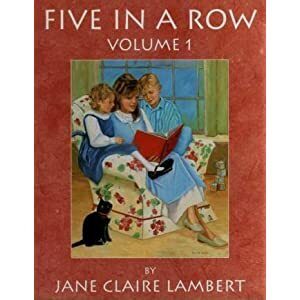 “School” mostly consisted of reading a fun, favorite, familiar picture book, followed by discussions about math, science, history and whatever other lessons might lie hidden within. It is a learning technique that we later used with Sonlight, and still use when reading with and to little ones. You may be shocked to learn that not one of my children has read proficiently before the age of 6. Most have been 7 or 8 when they really take off into books. I know most children are capable of learning to read at earlier ages, but in our experience it comes much more easily when you wait for them to reach developmental milestones. The concept that they struggle with at 4 or 5 or even 6 can simply “click” overnight when they are ready, and I suspect part of the reason my children enjoy reading so very much is because we waited until the learning process was relatively painless. How do I know when they are ready? I wait until a child expresses interest in learning to read, and we start lessons. If you are reading interesting books aloud to your children, they will want to learn to read for themselves. If they struggle with reading lessons, we back off and wait a while, then try again. Our oldest was a brilliant baby. I know every parent thinks that, but she used over 150 words by her first birthday. In 9 three-minute sessions she learned the sounds of all the letters – at the age of 19 months! Nonetheless, she was not ready to read until she was 6 1/2. Once she started, she was reading Tolkien and C.S. Lewis within 6 months. I tell you this because I don’t believe that school for a 5yo needs to consist of intensive phonics, penmanship, spelling, arithmetic, history, and science every day. That’s not to say you shouldn’t do it this way if it suits your family and your child, but it certainly isn’t a necessary or indispensable part of a very young child’s education. We are less structured now than we used to be, but even in our more structured days homeschooling for our 5yo more closely resembled educational play than institutional-style school. Instead, it is important to know and remember your ultimate goal(s) in education, and self-consciously work in that direction. We know ours. Do you know yours? This week, we four moms of many are talking about how to homeschool through chronic illness or pregnancy. If your morning sickness is bad enough, the two may sound and feel like the same thing. If we’re talking about things that bring daily school to a screeching halt, we could also add interstate moves to the list. We had a beautiful daily schedule when we lived in Ohio, and I had 6 children under 10 at the time, expecting #7. Once we moved, things were never the same again. I expected our move to change things, but I did not expect the change to be permanent. For this reason, I spent several months waiting for our lives to fall back into order naturally. It didn’t help that I was in the midst of my worst pregnancy ever, with non-stop vomiting, suspected gestational diabetes, little or no control over my diet (we were not living in our own home at the time), and several other major and inescapable sources of stress around us. When our lives didn’t quickly and naturally slip back into something resembling the old order, I spent several months sinking into a slow motion panic, afraid that the brains of our children were turning to mush while I watched helplessly from my miserable place on the sofa. See? Pregnancy isn’t always a breeze for moms of many. But I learned something along the way. I learned that not all education happens at the table with a pencil and a textbook. It doesn’t even always involve a book, though it almost pains me to say so. As long as children are not spending their days plastered to the television, immersing themselves in video games, or otherwise indulging in wanton purposeful brain damage, they are probably learning new things. That’s not to say that you should let them quit school and do what they want for the rest of their days. Just don’t panic if school isn’t happening the way you envision it while you are sick. Read to your children, and encourage them to read. Read together in your bed, if that’s where you spend most of your time. That is where reading lessons happen in my house even when I’m well. Make sure you provide plenty of good literature and nonfiction, and not too much “brain candy.” Children who read twaddle will quickly come to crave it just like the child who has been raised on breakfast pastries will crave that morning dose of sugar. It sometimes takes self control and extra effort to develop a taste for what is best for us. Have your children narrate back to you when you read aloud to them. Encourage them to tell the story in their own words. Very little ones often show a desire to do this naturally, like when your toddler wants to “read” you her favorite book. I have also let the young ones narrate to each other to help “catch up” when one misses a chapter of a book we’re reading together. Encourage the independent pursuit of hobbies and interests. Urge your children to dig deeper into what interests them, and to learn fun or interesting new skills. Talk to your children, and with your children. This is huge! Explain difficult concepts, even if you think they’re too young to completely grasp what you are talking about. You are planting seeds and concepts. Answer questions. Ask questions. Include them in discussions, even if they’re too young to really participate. Engage. Don’t sell your children short: everything is fair game at every age. Use videos judiciously. Work hard not to create an atmosphere where videos are the default method of entertaining children or killing time. Non-fiction and educational videos abound. Use them as a basis for discussions rather than just time-fillers. Let the kids watch a familiar/favorite video but require them to use the foreign language track rather than English. My kids groan, but never decline. So much learning can be self directed and self motivated, but often our children miss out on that aspect when we are strong and healthy enough to hover over them and manage all aspects of their day. It’s not good to leave a child to himself (Proverbs 29:15), but I do think that we are sometimes inclined to manage their days a little too closely. The inability to do so can sometimes provide new opportunities for growth and learning that our children might have missed otherwise. Since the 4 of us are bloggers, you might think this part was easy. We’re natural writers, right? So writing must come easily to our children as well. Can you feel the sarcasm dripping like honey from Pooh’s bee tree? First of all, writing doesn’t come easily to me. I remember asking for more writing work in school because it was one subject that I never thought I was really good at. I knew all the technicals of style and composition, and I got good grades. I was good enough, but never felt that I really had any spark in my style. After 6 years as a blogger, I have to admit I still often feel that way. You know that funny lady that can make a bad day sound so hilarious you almost wish you had the same day? That’s not me. She may live in my head, but we don’t see each other often. I’m the quiet, boring woman who gives an amused little snort at the funniest parts of the movie when everyone in the room is falling on the floor with laughter. I’m always a little surprised when I review old posts on my blog. I wrote that? Hey, I’m good! Learning to write takes a thorough knowledge of the technicals, followed by lots of practice. It’s a long process, never mastered but always improving – if you continue to work on it. I learned the technicals by taking a few short writing courses and writing endless essays for my dad. I gained more practice writing letters to friends and family and to one young man who initially had very little interest in returning them. Later, I practiced even more by joining the internet world in this crazy thing called blogging. Our children have followed similar paths, each in her own way. Some really do have a spark in their style. They may not have mastered the technicals entirely, but you really could say writing comes naturally to them. Even so, they have work to do. Talent may give them the style that some of us must work so hard to gain, but they still have to work to master the basics. I just spent a long time not answering the question, didn’t I? But I am a homeschool graduate myself, and I think I am one example of an answer to this question. My children are another. We teach our children to write first by teaching them to read. They are encouraged to read a lot. We try to steer them toward truly good writing: literary classics and more books by modern masters of the written word. We love to collect books and have built up a rather respectable library over the years. Filling their heads with good examples of great literature gives them a solid start in learning to write. I have always been fascinated at how easy it can be to deduce a child’s current favorite author by the evolution of her writing style. Over the years, we have also required them to write something daily. It may be a journal entry, a letter, a blog post, or a few paragraphs on an assigned topic. It may be a short story, summary of a book they read recently, or a poem. It may be copywork for the younger ones. This met with strong resistance at first, but they quickly adjusted and learned that it wasn’t as hard as it seemed. The more regularly we required this, the better they did. But a thorough mastery of the basics really does build both confidence and competence, and right now we have enrolled Kaitlyn and Lydia in an online interactive essay class with a live teacher. I mentioned this in another post, and after a few more weeks they are as challenged and inspired as ever. I know that I could probably do for them what he is doing if I took the time to create or follow a course, but I haven’t done it in such a structured way yet and it’s helpful for me to see his friendly critiques and praise of their work as well. He does an impressive job of balancing the two. It’s also helpful that they can see the other students’ work and the instructor’s notes on their work as well for comparison. It doesn’t hurt that he is funny, and has quoted The Princess Bride and other family favorites in his lectures. Kaitlyn is working on a post that details how the class works and what she likes best about it, so watch for that soon and have your questions ready for her! How have you taught your children to write compositions and essays? Although we all want to do things “the right way,” it’s generally not necessary to know and practice the very best method so long as we are working steadily toward a goal. God will bless our honest imperfect efforts to serve Him. We can take great comfort in this! This applies in homeschooling as well as other areas of life. This defines our goal and our method. If we are teaching them to evaluate everything they think, do and believe from a Biblical worldview – and giving them the tools to do so – we are succeeding. Deanna was an early talker with a huge vocabulary and an amazing memory. At 12 months, she knew and used 150 words. If you doubt me, I can provide the list from her baby book. She didn’t start putting them together until the thoroughly typical age of 18 months, but by then she had a very nice vocabulary to work with and rapidly became thoroughly conversant. I thought she was brilliant, and she was. However, it slipped my attention that while she was accomplishing milestones with great fanfare and expertise, she was still doing them very much on schedule. Because she was brilliant, we started working on reading early. I made a set of flashcards, and she learned all the sounds of the letters in 20 quick sessions over the course of 10 days – before she was 20 months old. She was going to read before she was 3. I was sure of it! But when we moved on to putting the sounds together, she just didn’t get it. She wasn’t ready. I put the reading supplies away for about 6 months to work on other things, and then we tried again. Still no progress. She wasn’t ready until she was ready. The ability to read is closely tied to certain developmental milestones, and she had to reach them before she could really make progress. At 6, it finally clicked. She went from zero to Tolkien in 6 months, and has been a voracious reader ever since. Sure, the right program and a lot of time and effort on both our parts might have provided the crutch we needed to get her over that hurdle ahead of time, but she was able to cross it with ease when she was ready. I have heard it said about potty training that you can start early and be finished by 24 months, or you can wait til the baby is 2 and do it in a few days. Our experience with reading has been much the same. There. Are you comforted and/or encouraged? February 9 – note to self: check the schedule. Oh, er…hello! Welcome back to the 4 Moms weekly posts. You can welcome me back, too, because I’ve been gone for a few weeks. I had a lovely break from blogging over the holidays, but sadly I won’t remember a bit of it since I DIDN’T BLOG ANY OF IT. Ironic, no? At least I’m blogging about our recent rodential invader, so we’ll remember that story in years to come, but that’s not why you’re here today. You’re here to learn how I teach my children grammar. Because I am a homeschooler, and obviously I teach my children grammar, right? Wrong. Maybe you already picked up on that when I began a sentence with a conjunction. I don’t teach grammar. We are relaxed homeschoolers, so I love it when real life results in lessons learned relatively painlessly. Texts may be better at covering all the bases in an orderly fashion, but is that approach really intrinsically superior? Will my children be stunted in “the real world” if they don’t learn all their Important Facts & Concepts at the institutionally determined appropriate age and time? Will they miss out on job opportunities because I forgot to teach them to diagram sentences? Will they be less able to glorify God and enjoy Him forever? If I’ve done my job properly, they will have the ability to crack a book (or open up google) and learn to diagram sentences should the need arise. The same goes for conjugating German verbs, identifying the bones of the human hand, and memorizing the names of the early Chinese emperors. While they are learning, I also want to teach them to learn. I don’t want to simply pour facts into open minds. I want active minds that are constantly learning, growing, inquiring, and thinking critically. I’m not saying these things are unimportant, or that none of my children have or will learn them, but they are incidental to the ultimate goal of Christian education. I’m also not saying that there is anything wrong with a more structured approach. We have used Saxon math for many years. Kaitlyn and Lydia are currently enrolled in an online interactive essay class to help develop and polish their writing skills. We have used other textbooks and formal courses on occasion, but they are not the backbone of our curriculum. So…how do my children learn grammar if they’re not filling in the blanks of a grammar workbook 3 days/week for 12 years? They read, and they write. I read what they wrote, and we talk about what they read and write. I correct their spoken and written grammar as the opportunity arises, talking about the parts of speech and explaining the difference between objective and subjective pronouns, etc. OK, so maybe I do teach them grammar, but I don’t know why they call me the Gramminator. Learning happens other ways, too. We play Mad Libs. I have a book called Eats Shoots and Leaves that I want my older children to read. They learn in the course of real life, the way so much other learning takes place. Smockity Frocks, who does it a lot like we do but makes it sound better. Common Room, who does it the way I envision myself doing it, but somehow we never quite get there. Raising Olives, who does a beautiful job of blending formal and informal grammar instruction. We’re at the beach having a fun and wonderful couple of days with lots of sun, surf, good food and family, and I left my brain at home. I stayed up late Tuesday night working on my 4 Moms post so that I could be ahead of the game and have Wednesday free to play, and guess what I did: I did the wrong 4 Moms topic. So now I’m really ahead of the game because next week’s post is ready, but I can’t go play with my friends until this week’s chores are done. We’re going to tell you a little about homeschooling the “different” or challenging child. We don’t have any diagnosed disabilities in our household, though I have to admit I wonder every now and then. Is it really that hard to keep your bedroom clean? Maybe they do have a problem. Is there a name for a disorder that prevents one from seeing a mess and cleaning it up, like the opposite of OCD? Cleaning Preventative Syndrome? Oblivious Disorder? I think we have that. But while we don’t have any official learning disorders, I do suspect that at least one of our children is mildly dyslexic, and some have simply been ready later than others. We have dealt with this mainly by relaxing. There is no need for them to learn on a schedule, so long as their minds are active and growing. If a child is struggling with a concept, we put it aside and work on something else for a time. That “something else” may or may not be related to the struggle, but when we are ready to revisit the struggle, we often find that it goes much differently. This has been the case with reading for several of our children. None have read before the age of 6 1/2, and some have not read fluently until 9 or 10, but all so far are voracious readers. It’s important in these cases to read aloud with and to the child so that learning can continue and his/her vocabulary can continue to grow – audio books are wonderful too – but in our experience no damage has been done by waiting a bit until she’s ready to fly when it comes to reading. Another thing I have learned over the years is to work with a child’s learning style rather than forcing her to conform to my own. The Way They Learn by Cynthia Tobias was very helpful to me back in those early years, and now I am constantly analyzing my children in terms of learning style. When a child learns very differently from her teacher, I think this can sometimes be perceived as a disability rather than just a difference. My mom, who homeschooled 14 children, thinks this has a lot to do with why so many boys are diagnosed with ADD or ADHD. They are simply more active and have a different learning style than girls, which makes them harder for a female teacher to deal with. As one small example, Mom found that a particularly high-energy brother of mine did much better on his school if she allowed him stand next to the table rather than making him sit. With one of my more active girls, I found that her memory work came much more easily if I allowed her to fidget or even stand on one foot as she recited. After initially trying to make her stand still like a proper young lady, I asked myself why I was making it harder for her. She knew how to stand still when it was necessary; why not let her work the way that her brain preferred? She no longer does this, but remembers those times as fun rather than frustrating. I like that. My most talkative children learn best if they are allowed and encouraged to use their superpower (talking), and I don’t fight that. We try not to let them be disruptive to those around them, but we allow them to talk about what they are learning, realizing that they process new concepts better while they are chatting away. And now, I’m off to the beach. Over and out.